In our commitment to provide you with products that would exceed your expectations, we present to you 5 salt scrubs (including 3 dead sea salt scrubs) designed to moisturize dry skin and tighten skin on the body. After hours of in-depth research, we finally picked what we think is the best sea salt scrub based on its gentleness on the skin, ability to deliver its promise, and affordability. Made with the finest ingredients, having the Vitamin C Scrub by Asutra is like having your own spa at home. It is filled with essential oils to moisturize dry skin while removing dead skin cells. 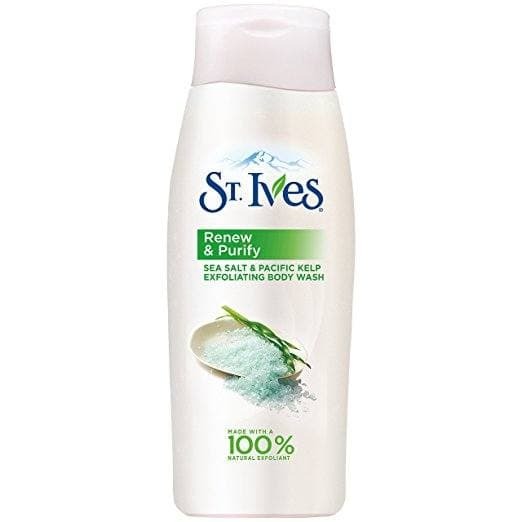 Free of parabens, the Sea Salt & Kelp Body Wash by St. Ives is dermatologically-tested safe for sensitive skin. This exfoliating body wash is ocean-inspired and will surely relax your senses. Dead Sea Collection’s Dead ﻿Sea Salt Scrub with Coconut Oil leaves skin with a subtle shine to make it appear healthier and vibrant. It works best on dry skin especially those in the heels. The Lavender Vanilla Body Scrub by Body Essentials is full of vitamins and essential oils for the ultimate skin detoxifier. It offers a money-back guarantee so you basically have nothing to lose. Vivo Per Lei’s Salt Scrub is the best (and most luxurious) way to cap off your day. It removes dead skin cells from the body revealing younger skin everyone will surely be jealous of. To help you get softer and smoother skin, below is our in-depth review of the best sea salt scrubs. Pure Himalayan sea salt and a blend of essential oils are what comprise this best salt scrub. It sloughs off dead skin while detoxifying the skin to make it appear more beautiful and smooth. Great for dry skin, this product is rich in sweet almond, argan, and jojoba oils plus aloe which are known to deeply hydrate the skin. This is key to soft skin you can actually see and feel. The product’s main ingredient, pink Himalayan sea salt, mildly exfoliates and polishes the skin at the same time. Its granules are ground extra fine to ensure an effective yet gentle exfoliation. But besides exfoliation, this body scrub helps fight a number of skin conditions, too. It is loaded with skin-friendly nutrients that may be effective against age spots, acne, and even eczema. Made from natural ingredients, this product guarantees you’re not putting any harmful chemicals into your skin. Its citrus smell is deliciously relaxing you’ll feel you have your own spa at home. Leaves skin super smooth you can even skip moisturizer afterwards! Hypoallergenic, this best salt scrub for dry skin is infused with 100% natural extracts to brighten skin without the harshness. It is ocean-inspired so you’ll feel like on vacation with every wash.
Well, close enough.Hailing from the Pacific and Atlantic oceans, its sea salt extract removes dead skin cells for soft and smooth skin in an instant. Sea kelp extracts, on the other hand, invigorate tired-looking skin. Ideal for people with dry skin, another ingredient this exfoliating body wash boasts of is glycerin. This ingredient draws in moisture and further nourishes skin to leave it supple, smooth, and soft. Formulated without parabens, this product is great for all skin types and is gentle for daily use. It has a creamy and rich lather with a light, crisp smell that’s perfect to either start or end your day. With regular use, this exfoliating body wash takes care of dry skin to reveal your most youthful-looking skin. It provides unbeatable moisture with its antioxidant and vitamin-rich formula. This best sea salt body scrub, along with dead sea salt, is infused with coconut oil for the best shower experience. It is very rich and leaves skin with a slight sheen even after rinsing it off. Packed with minerals, Dead Sea salt is proven to help with skin conditions like psoriasis and acne. It also improves the skin’s hydration, reduces inflammation, and has anti-aging benefits. Coconut oil, on the other hand, is a great moisturizer making it ideal for those with dry skin. Its high antioxidant levels protect skin from everyday stressors and can help with premature aging. This body scrub is also infused with other natural plant oils such as Wheat Germ and Sweet Almond oils. Aside from being great for dry skin, these oils can also help even out the skin tone. Our major complaints are that it makes the bathroom floor slippery and dries out very easily. So our advice is to use it immediately after purchase and use it with caution to avoid any accident. This best dead sea salt scrub boasts of its Dead Sea salt content to renew the skin the natural way. It is also infused with lavender to detoxify skin and vanilla bean oil to heal cells from within. Rich in vitamins and essential oils, this body scrub has lemongrass, avocado, rose, and jojoba oils to nourish dry, cracked skin. It is infused with vitamin E to protect skin and lock-in moisture. We love that this scrub has anti-aging benefits. Dead Sea salt helps tighten and firm skin while other natural ingredients help with age spots, stretch marks, and even wrinkles and fine lines. This product is free of additives and fillers and does not leave skin with an oily residue. It rinses off easily and completely, and has a soft lavender smell that’ll remind you of a day in the fields. Lastly, the company even offers a money-back guarantee. They’re that confident this product really does work—but if it doesn’t for you, you can easily return it with no questions asked. Enriched with natural oils, this best sea salt scrub to tighten skin helps revive the skin to bring back the radiance it lost. It conditions and softens skin and offers results that last the whole day. This product is very easy to use and rinses off easily without leaving an overpowering smell that lingers on your skin. It comes in a clear pot where you can conveniently see the actual product. Though marketed as a body scrub, we sometimes put a small amount into our facial cleansers, too. Aside from giving you a deep clean, it will give you a nice, noticeable youthful glow as well. Mild and gentle, this product isn’t harsh on the skin and works great at relieving you from winter hands. Dry, cracked hands will get their moisture back and look new after only a few treatments. We also love that this scrub leaves out a subtle shine after rinsing it off. This makes the skin appear healthier and more nourished than it actually is. Alas, the most dreaded question: which one’s better to exfoliate my body? Sugar and salt scrubs are both great for exfoliating dry skin so technically, none of it proves to be more superior. They both promote youthful-looking skin by sloughing off dead skin cells. Because of this, you may think one type could replace the other—but you’re wrong. However similar they are, what you choose still depends on your skin type and skin condition. Since salt is naturally coarser than sugar, salt scrubs tend to be more abrasive and may be a better choice if you’re struggling with flaky, dry skin especially on the body. Furthermore, since sea salt (the ones used for these types of scrubs) is packed with minerals, your skin is actually getting more benefits than you can imagine. The mineral content of sea salt is very relaxing and therapeutic. It can also help reduce inflammation, improve blood circulation, and firm and tighten skin.However, since they are very abrasive in nature, salt scrubs aren’t ideal for daily use. They also shouldn’t be used on thinner, sensitive skin to cut the risk of irritation. Since sugar granules have rounder edges, sugar scrubs are great for sensitive skin because they do not cut the skin. Sugar is also a better choice if you plan on making face scrubs. Sugar melts and easily dissolves in hot water meaning it won’t leave skin with a grimy feel. And because sugar scrubs don’t dry out the skin, they are most suitable for those who have dry skin. Though less-abrasive, one downfall is that sugar isn’t as mineral-packed compared to salt. This means you won’t be getting the same health benefits you get from its coarser counterpart. Exfoliation is a must in any beauty regimen to remove dead skin cells and increase the potency of other skincare products. And when it comes to exfoliating, sea salt scrubs are your best bet. Unless you have super sensitive skin. We have chosen the Vitamin C Scrub by Asutra as the winner of this round as the best sea salt scrub. This body scrub mildly exfoliates and hydrates dry skin to reveal soft and supple skin you’ll find hard to resist. This natural and organic product fights a number of skin conditions for healthy skin from head-to-toe. They have a money-back guarantee: that’s how confident they are with their scrub. Unfortunately, this product does come with a high price tag. But a lot of people have sworn by it and if ever you aren’t satisfied, they offer a refund policy—a win-win situation, don’t you think?